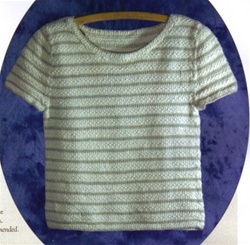 This simple to knit Tee with soft contrasting stripes and seed stitch rows will become a summer favorite. The easy care Ecoknit organic cotton for this wash and wear shawl improves with gentle machine washing and drying. It causes some shrinkage, which has been factored into the design and final measurements. Recommended for Intermediate knitters. 6 sizes to fit X2S-XL: 28-30" (32-34", 36-38", 40-42", 44-46", 48-50") takes 5 (6, 7, 8, 10, 11) skeins main color and 2 (2, 3, 4, 4, 4) skeins of contrast color.